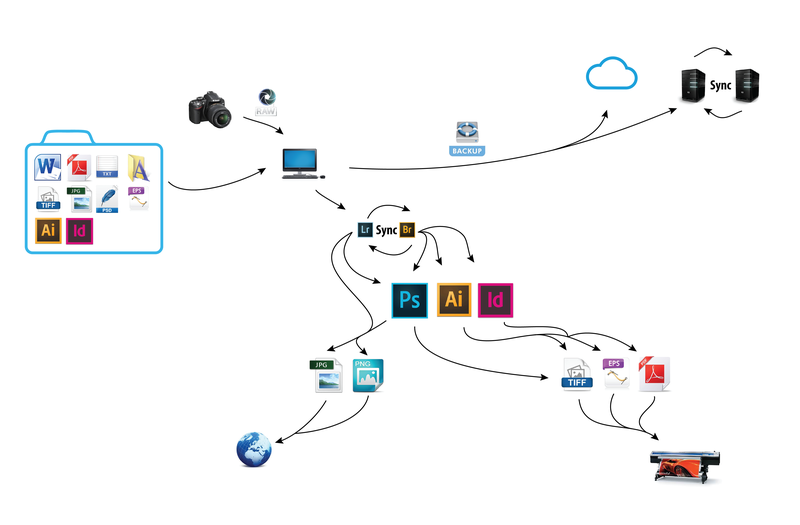 In the above diagram you see that first all the data is taken into the computer and a backup is immediately done in several devices. Accidents may happen and equipment’s may experience failures or just get totally damage. Even dvd´s or memory cards may lose their data or brake. That is the reason why so many companies invest in backup systems. There is valuable information or data that once is lost it may not be able to be recovered. It can also cost the company or the person that holds the data a lot of money in claims or by trying to do it all over again if it is even possible. So a simple solution to it is to make periodical backups in several devices and if possible include a backup in the cloud so if one thing goes wrong there will be always a chance to restore the data. After the backups you will have a bunch of different type of files. Pictures or video files can be reviewed with Lightroom and minor nondestructive editions can be applied from here. However for the rest of us that use heavy vector graphics, text, and multiple layers exist Adobe Bridge. It is like a computer explorer but adds more functions such as rates, metadata, filters, and much more. There is even a possibility to synchronized Lightroom and Bridge so you can use both programs at the same time so you get the best of both worlds. Once you have the file you need you can start to do your work in your desire project. From the editing programs you can send the output to the diverse media or production process. Nevertheless while those files are building up in the system we should make logical approach to the way we handle them. JOBS: this folder includes all the clients and can be eventually be organized by its initial letter, year or fiscal year. It can even be organized by all the previous mentioned methods, that way you filter and reduce the amount of files to review. 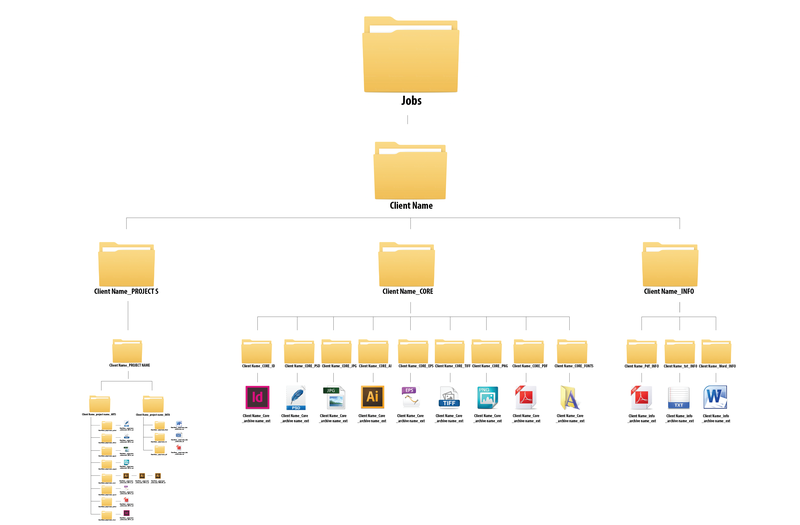 Of course with the help of Adobe Bridge you can make an overall view with all the files next to each other or use the metadata to reduce even more the search options. 1-INFO: here I pretend to place folders that will carry txt, PDF or word files that gives information about the client such as if there is a corporate manual with rules for design, or e-mails with important information, documentation or contacts that are link to this specific client. Those files are not always needed for a project. However they will give you guidance if they even exist. 2-CORE: this will display all sort of files in each specific folder. Those files are original files that you get from the client and goes from vector graphic to images and even fonts. 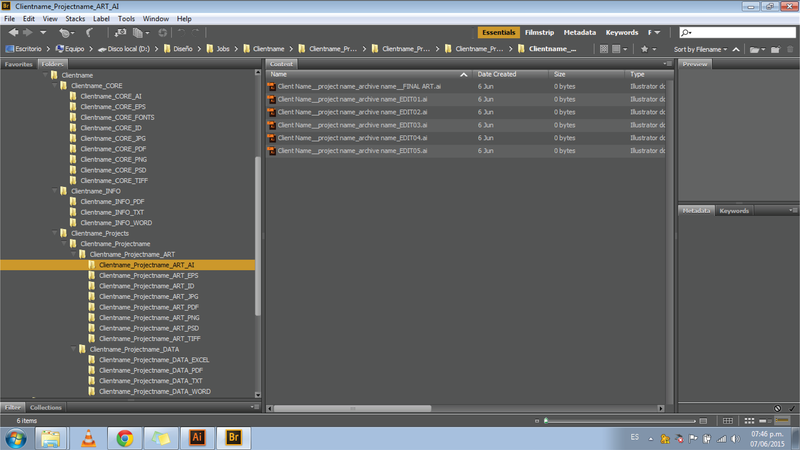 DATA: here a similar folder to INFO however this includes specific files that will be used within the design. It can be text for a book or a flyer, additional logos that are not included in the CORE folder, spreadsheets from excel with calendars and you name it. ART: this folder is where the actual work will be done. You will take the original files from CORE and will place them here with a new name and you are off to modify it as much as you want. Once all that information is assigned to a file name it should allow us to have a better control over those files and with the use of metadata that can also be added from the design programs, Bridge or Lightroom the searching and finding of files should be very accurate and time effective. Avoiding error such as handing out the wrong file for production or and incomplete project to a client. It is also a good idea to have a checklist to ensure you have completed all the procedures. Below I place mine. I hope this can help you and if there are advices or tips you would like to share I am more than welcome.